As promised, here are a few more collab manis I have done recently on Instagram with other nail girls! 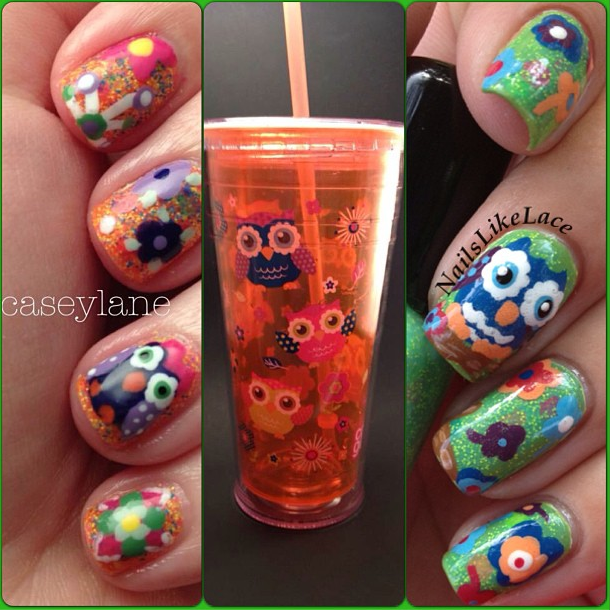 First up, I did an owl mani with @caseylanelovespolish inspired by the print on a cup she has. The base for my owl nails is China Glaze Tree Hugger with one coat of Pretty & Polished Bayou Blitz. Casey said it perfectly when she said Bayou Blitz is like the lovechild of Lush Lacquer Clowning Around and Salon Perfect Zapped! It is such a cute polish! 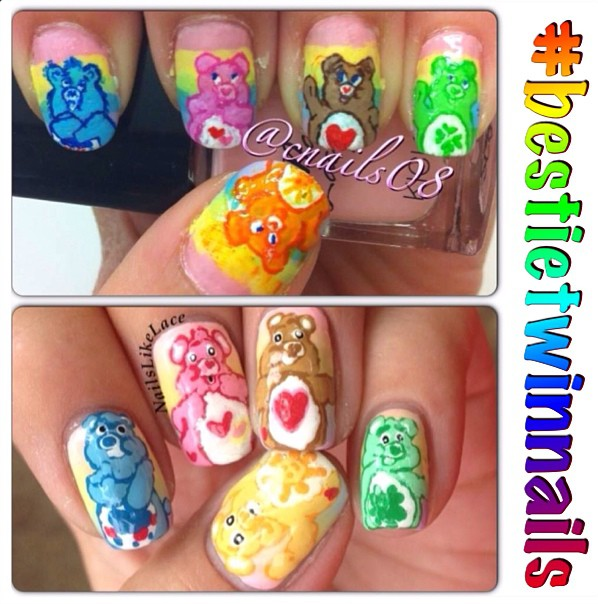 Next, I did Care Bears with @cnails08. We decided to do something that challenged both of us. I am terrible at painting characters, and her gradients need more practice. So we did both! I hated how mine turned out originally so much though, that I decided to take a stab at the bears again but create just bellies, and I loved that design way more! 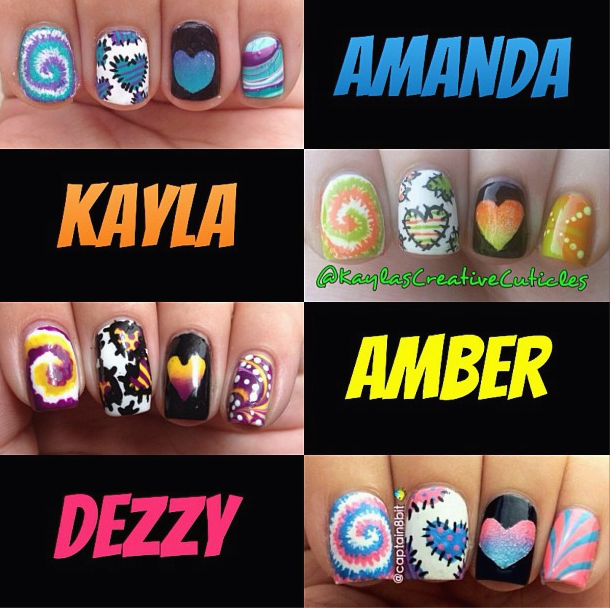 Lastly, I did a quadruplet design with @kaylascreativecutivles, @captain8bit, and @highonpolishes. We went with a heart theme and each picked one technique to use: water marble, gradient heart with black background, stitched hearts, and tie dye. 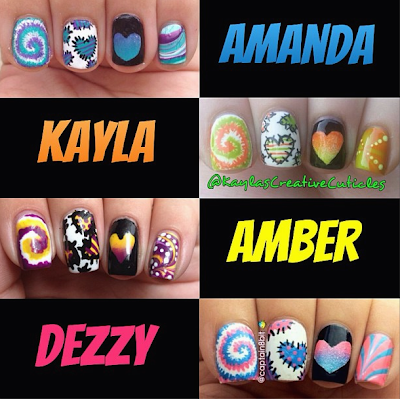 We each did a two-color mani (with black and white as accenting colors) and each had two different colors. 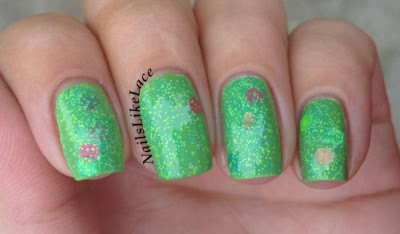 I'd always wanted to try tie-dye nails before this collab, but had never gotten around to it. I'm glad I was finally able to, though, because that is my favorite nail; I love how it turned out! I've been doing a lot of triplet nail collabs with @amylovesnewwave and @paintmainails too, so I'll have a big post about all of those tomorrow!